4 Bedroom, Pet Friendly Home in Palmetto Dunes! If you want luxury, space and a home that will accommodate your furry friend, then this is the perfect place for your next family vacation. High cathedral ceilings welcome you openly once you step into the entry foyer and continue your way to the open living room area. Furnished with a blue couch and matching loveseat, two cozy armchairs, a custom built entertainment center housing a 52” flat television, a DVD, and even a CD player with surround sound, a decorative granite- finished fireplace (guests- use prohibited), and completed with views of the picturesque backyard. The wet bar sits just between the dining room and living room so that you will have plenteous space to create your favorite cocktails; add wine to the mounted wine rack and you are ready to entertain friends and family when they stop by. 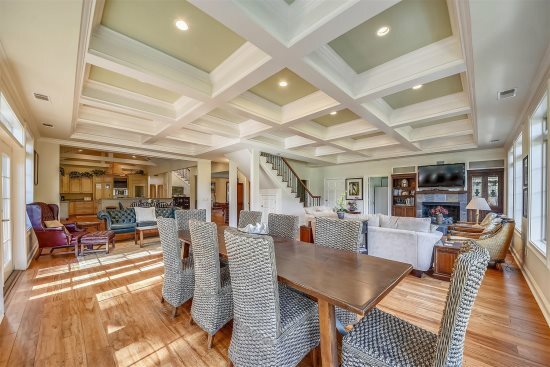 The dining room offers a coastal feel with its large wood table along with six matching, but comfy chairs. Additional seating can be found in the sleek kitchen. There are two stools complimenting the shiny, granite countertop and four more chairs surrounding the extended, custom-built, granite island. If you are not impressed by the island, then maybe the custom cabinetry to store all your groceries will, along with the all black appliances to help you create your family’s’ traditional vacation meals. Sliding glass doors lead to the picturesque backyard, with space to play a football game or two, lounge chairs to sun tan while reading your favorite novel, a pool to cool down after lounging all day, and a hot tub to erase all your woes while relaxing your mind. After the sun has set for the evening, sit in the chairs by the lagoon and star gaze into the galaxy. The master suite decked in browns and blues, offers a king-size bed, a flat screen TV, its own private bathroom with a jetted tub, and even a sliding glass door to a small patio; sit here and plan the family’s daily itinerary or enjoy a light breeze in the evenings while everyone is in the pool. The other two bedrooms feature a king-size bed and two double beds respectively; they both offer flat screen televisions, plush berber carpet and share the “Jack-n-Jill” bathroom. A washer and dryer is also located on the main level for all your laundry needs. A spiral staircase will lead the way to the second level of this adorable home. The loft is complete with four twin beds, one trundle bed, a 42” television, two chairs, a game table, and plenty of space for kids and young adults to run around and burn all their energy. A tiled, walk-in shower embedded in pebbles is also located in this area. Cute, chic, spacious, and fun for the entire family; this home is one of a kind and is the perfect option for your next getaway! 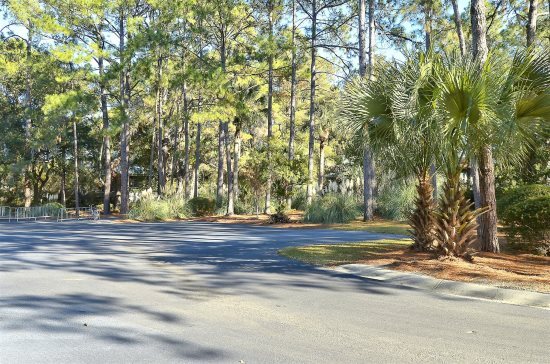 Palmetto Dunes is a 2000 acre oceanfront resort that reaches from the 3 miles of white sandy beach, through 11 miles of lagoons, 3 golf courses, and 25 tennis courts, to the bikeway under highway 278 that provides access to the Shelter Cove Marina, shops, restaurants, and Mall. All beach distances are measured from the center of the complex. I really was very happy with our rental experience. We had plenty of towels and the kitchen was stocked with everything we needed fir the week. Everything was clean and comfortable. We thoroughly enjoyed our week.